Putting quinoa in something else weird. Again. I wish I could be cool and not so common, but I’m not. I like some quinoa in some things. You know. This dish was part of our semi untraditional Thanksgiving a few weeks ago and it was awesome. 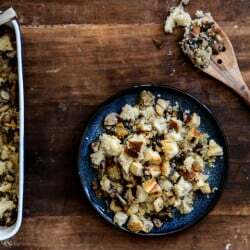 I haven’t made a new stuffing recipe in a few years and I knew I wanted something different. Quinoa was an obvious choice because 1. it’s everywhere and 2. the texture! Oh the texture. I knew it would give the tiniest little pop to the stuffing along with the crunchy-topped bread. I was downright obsessive over the thought. Speaking of stuffing, what do you call it? I know that it’s technically only “stuffing” when it’s stuffed inside the bird (which, for the record, is my absolute favorite and I will fight to the death for the inside-the-bird stuffing) but we make extra in order to have enough for everybody (and hello, leftovers) and still call it stuffing. I just don’t think it’s called “dressing” here. Maybe I’m just clueless. Anyway, this is actually dressing. But it’s really stuffing. My previous favorite untraditional stuffing included cornbread and sourdough. I was on the fence when it came to creating a new dish because it felt like I used up all my bread options. I was tempted to do croissants or biscuits, but thought it might become more like a bread pudding than a stuffing. I wanted it to have the same comforting texture of regular old stuffing but still be… different. Are you picking up what I’m throwing down? Then I came across a loaf of pretzel bread in my grocery store. I practically praised the heavens because it truly might have been a miracle. I can’t ever find things like cacoa nibs or real cane sugar in my store, so I certainly was not looking for pretzel bread. Oh the things that smack you in the face. I bought a loaf, but in the past I made these pretzel rolls that you can bake if you’re outta luck. Anything pretzel and I’m sold. Also, anything pretzel and I want cheese sauce. I was about 30 seconds away from creating cheese sauce stuffing. Oh and we must talk about the celery. Or shall I say: lack of celery. There are a few ingredients in the universe that if they magically disappeared, I would not shed one tear. One of them is fennel seeds. The other is celery. No no no. I just can’t get behind it. Not in my stuffing, not in my chicken salad, not in my anything, not with my peanut butter. I will not ride that gravy train. My mom loves celery and loads up all of the aforementioned things with tons of it. Her stuffing is excellent but I pick around the celery as much as I can. I hate being that person. So. This dish here is also a direct result of my garlic butter mushroom phase. Can’t stop it. If you don’t care for mushrooms… you should probably just make an entirely different recipe. Like this one. The stuffing you see here is pretty much based on mushrooms. Don’t worry, my dad would agree with you that we’re eating fungus. He would not partake. Me on the other hand… I would like to eat this whole dish for breakfast. Preheat the oven to 375 degrees F. Place bread cubes on a baking sheet and bake them for 8 to 10 minutes, just until they are firm and almost stale, but not too brown. Heat a large skillet over medium-low heat and add butter and olive oil. Add in the shallots and mushrooms and stir to coat. Cook, stirring occasionally, until the mushrooms soften, about 6 to 8 minutes. Add in 3/4 cup of the stock and bring the mixture to a simmer. Stir in the garlic and cook for 30 seconds, then turn off the heat. Season the mushrooms with the salt and pepper. In a baking dish (9×13-inch will work, so will something slightly smaller), toss the bread cubes, quinoa and mushroom mixture together. Stir in the sage, parsley and thyme. Drizzle the remaining stock over top evenly, adding a bit more if the bread looks very dry. I like my stuffing a bit crunchy, so if you prefer your’s to be super soft, add more stock. I find that with the salty pretzel bread and the stock, there is no need for more salt. Bake the stuffing for 35 to 40 minutes, until slightly golden on top. Tent it with aluminum foil if it becomes too brown. Stuffing is not very pretty. I swear it tastes pretty though. I call it stuffing no matter if it’s been in the bird or not. My favorite part is the crispy bits that are hanging out of the stuffed turkey. So good! This mushroom and pretzel bread sounds like a great combo. Mmm thank goodness you tried something new with this stuffing so that you could share! This is awesome! LOVE the idea of using pretzel bread! That is ingenious!! I bet I could get my Husband to east quinoa this way!! Love your recipe! Perfect spin to traditional stuffing! This might make me actually LIKE stuffing. I’m with your dad on the mushrooms (believe me, I wish it wasn’t so! ), but this has even me intrigued. I love pretzel bread but can never find it. I get so ridiculously happy when i can find “foodie” things at my local store, though. It makes my day. Is that sad? Ooh I like this talk of unconventional stuffings! I’ve never been a fan of the inside-the-bird stuffing, but I’m certainly open to a little on the side, especially if it contains mushrooms. This sounds awesome! Wait one minute though…what about fennel seeds in Italian sausages? Aren’t they sort of a necessary evil there? nope, can’t do it. not a fan. that’s why i don’t have any sausage recipes on my blog! Haha – no kidding! Well, I respect it, woman!! I totally call it stuffing, never dressing! This looks so good! I love the quinoa! It breaks my heart that you hate fennel enough to forego sausage — but you mended it again with your love of pretzel bread. ZOMG. I so get you! And I’m 14 years older than you- So I guess we are both still adolescent teens! LOL! I love sprinkles- they make anything fun! HATE celery, hate fennel seeds, but oh boy! do I love me some shrooms!!! Bring ’em on! and it is definitely called stuffing, end. of. story. I TOTALLY agree with you about celery and fennel seeds! I get so mad when I find chopped up celery in my chinese takeout, because in my opinion it’s even worse cooked. So, I’m definitely picking up up what you’re throwing down here. I don’t like regular fennel, either…do you? yes that’s the crazy thing, i actually really enjoy fennel! just not the seeds. Mushrooms are a fungus. But I forgive you and still want to come to your house for pre-thanksgiving festivities. Please&Thanks. I think I just died and went to stuffing heaven. The end. I made a Cranberry Prosciutto Stuffing a few weeks ago and ran into the same exact issue – this ish is just not photogenic!! But luckily stuffing is freakin’ delicious in all shapes and forms, so there’s that. I just can’t call stuffing “dressing” either. it just sounds weird. Like salad dressing, i don’t get it. Anywho, i would eat this all up! Love the addition of quinoa–and mushrooms are a must in every stuffing. I want to eat this now! I just had stuffing made from bagels and thought that was good. Pretzel bread stuffing just won. I am making a vow to myself to make this throughout the year-not just at Thanksgiving. It looks delish! I would say this definitely qualifies as nontraditional, but it sounds so, so good! Awesome recipe! I can’t wait to share it with my mom! I’m freaking out over this stuff! My sister really hates stuffing because she has a major aversion to soggy bread. With the quinoa, I think she’d really like this! Ha ha, I love fennel seeds AND celery. At least we can agree that pretzel bread is awesome. And cheese sauce. Looks like a great recipe! Another bread option would be French Onion Soup Bread Pudding. Make your typical custard without the sugar. Add salt, beef base, garlic, and let it cool, and mix in swiss cheese with a hand blender. Caramelize onions, and add to cubed bread soaked with your swiss cheese custard. Bake at 325 until set (45/55 min). Another Starch option besides potatoes or rice….. Believe me,,, it is goooood! jason, this sounds incredible. thanks for sharing! This sounds so good! What an interesting combination! The fact that you loaded this up with mushrooms makes it all ok! Now I want cheese sauce stuffing. GIVE THE PEOPLE WHAT THEY WANT! I love mushrooms and although I’m not one for stuffing, this would be one I’d love b/c it’s all about the shrooms. Interesting that you dont like fennel yet you love sage. They’re so closely related I find that I’m surprised you’re not into them both. I actually love fennel when it’s roasted and it gets all caramelized…mmm, so good! Gotcha!! :) Yes the seeds are their own thing, that’s for sure! Yum this looks so so amazing and I’m really digging the quinoa you added in too! This is an awesome take on stuffing! I’m going to a turkey-free vegetarian Thanksgiving and I’m planning on trying this as a vegetarian side! oh wow, this sounds delicious! This might be the only forseeable way to feed me quinoa – surrounded by other completely necessary and life altering pretzely carbs. This I can do whole heartedly. Umm whaaat? Pretzel Bread + Mushrooms?!?! I’m making this. For Thanksgiving. DONE. Dana Ivy – http://www.iadorewhatilove.com – Check out my blog!! Love this recipe but cannot find Pretzel Bread anywhere! Where did you find it? Pingback: Thanksgiving Meal Inspiration - Salted Crown | Food, Fashion, and All things in between.